Boasting the safest sharps containers and medical waste management systems in the world, Daniels products and solutions protect healthcare workers and those in their care. Container Related Needlestick Injuries were reduced by 86.6%"
A 6-year, 3-phase study compared the use of a small patient-room sharps disposal container with the Daniels Sharpsmart reusable container. 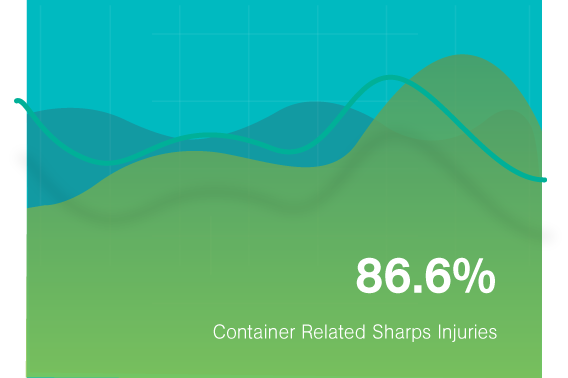 In phase 1 of the study, the facility utilized disposable sharps containers and recorded 19.4% of sharps injuries being container-related. 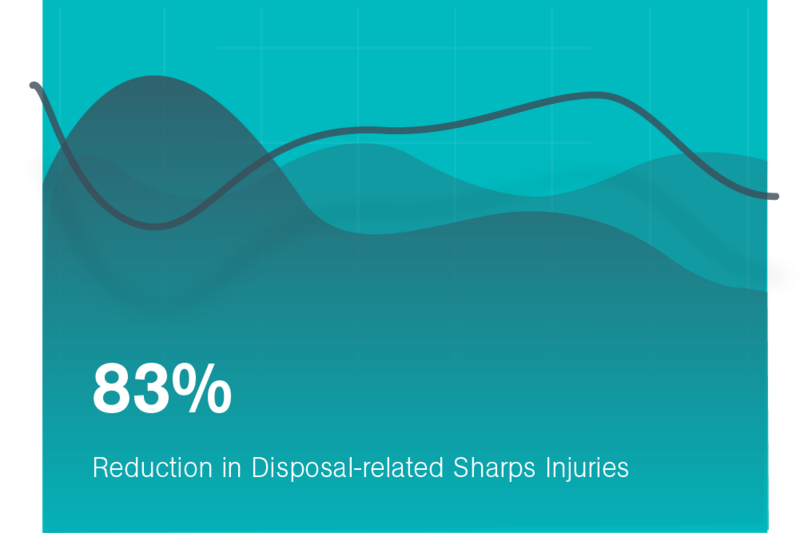 In phases 2 and 3 with the introduction of sharpsmart, container-associated sharps injuries were reduced to zero, disposal-related sharps injuries fell by 83.1%, and recapping sharps injuries were reduced to 85.1%. A study took a sampling of sharps containers from five healthcare facilities in Florida. 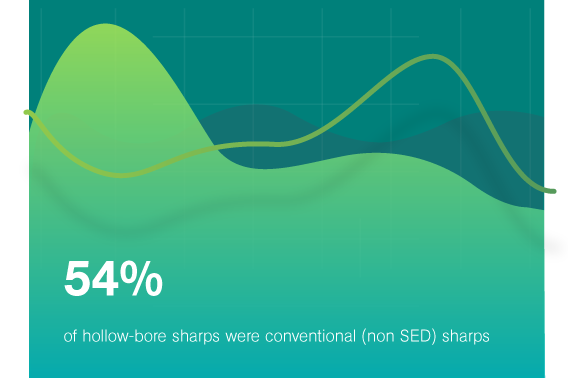 Contents were decanted, categorized and counted to identify the proportion of hollow-bore safety engineered devices (SED) among the sharps present, and the proportion of SED correctly activated. 69 Gallons of sharps from 18 sharps containers were examined, revealing 54.4% of hollow-bore sharps were conventional (non SED) sharps, 39.9% of conventional needles were capped, and 21.6% of SED were not activated or activated incorrectly. A study carried out in 8 acute care hospitals ranging in size from 150 to 850 beds in Australia, New Zealand and Scotland, compared Daniels Sharpsmart to 10 alternate sharps container brands. Upon implementation of the Daniels system, results revealed an 86.6% reduction in container-related sharps injuries, and a 25.7% reduction in non container-related sharps injuries. A 6-year, 3-phase study compared the use of a small patient-room sharps disposal container with the Daniels Sharpsmart reusable container. In phase 1 of the study, the facility utilized disposable sharps containers and recorded 19.4% of sharps injuries being container related. In phases 2 and 3 with the introduction of sharpsmart, container associated sharps injuries were eliminated completely. A 6-year, 3-phase study compared the use of a small patient-room sharps disposal container with the Daniels Sharpsmart reusable container. 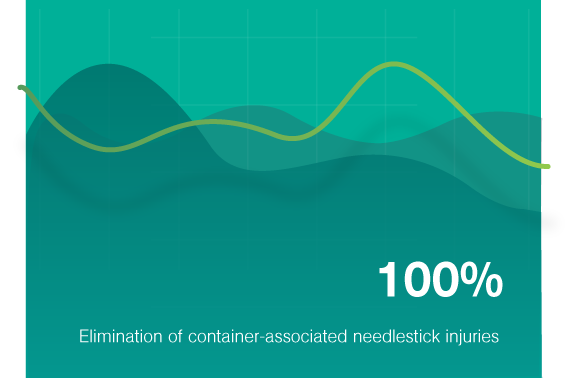 In phase 1 of the study, the facility utilized disposable sharps containers and recorded 19.4% of sharps injuries being container-related. 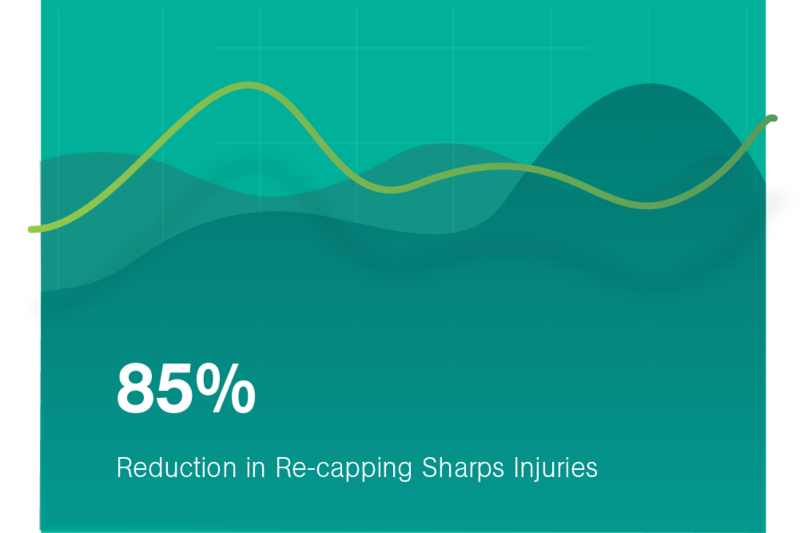 In phases 2 and 3 with the introduction of sharpsmart, container-associated sharps injuries were reduced to zero and recapping needlestick injuries were reduced by 85.1%. What would happen if you put ‘Safety, Infection Prevention and Clinical Approach’ at the forefront of healthcare waste? With the direct cost of managing a needlestick injury estimated to be up to USD 4,800 per injury, fewer needlestick injuries, minimized infection transfer risk and more efficient medical waste and sharps management will help your healthcare facility to lower its overall costs. 'Making Healthcare Safer' is the philosophy that guides Daniels; we are committed to developing the safest, most environmentally friendly products and services available for everyone involved in healthcare. Our products and systems have been developed with extensive input and advice from healthcare workers around the world, including clinicians, safety and health personnel, infection control, EVS managers and support staff such as cleaners and orderlies. Our primary focus is the reduction of needlestick injuries through safer sharps management systems and practices, but our safety approach goes even further. At Daniels we take into account other healthcare worker risks such as the potential for back injuries if collectors or accessories are too heavy or difficult to move, compliance expertise, and waste segregation solutions that minimize risk exposure and infection risks. The Sharpsmart system’s performance has been proven in peer-reviewed, evidence-based studies confirming significant needlestick injury reductions and is voted “Best System” by healthcare workers. Daniels Sharpsmart collectors arrived pre-assembled at your healthcare facility in bulk transport units; this eliminates staff time needed for assembly of containers, needlestick injury risk from incorrectly assembled containers, and eliminates cardboard packaging. Sharps containers should be placed as close as possible to the point of sharps generation. Correct placement of collectors is an important part of the success of the Sharpsmart system. A wide range of accessories and mounting options ensures a Sharpsmart collector is where you need it, when you need it. Many healthcare workers suffer needlestick injuries from overfilled sharps containers. Sharpsmart collectors eliminate this risk with their unique, gravity balanced safety tray which eliminates hand-access to contents and automatically closes when the fill-level is reached, thus preventing any chance of overfilling. When full, Sharpsmart collectors are locked by engaging tamper-proof side locks which cannot be re-opened manually and can only be unlocked during Daniels' robotic wahing process. This security measure eliminates risk of unauthorized access to contents in storage and transport. Sharpsmart is certified to United Nations PG2 specifications for Transport of Dangerous Goods. No additional packaging is required to transport Sharpsmart collectors on public roads. In transport, Daniels purpose-built transporters ensure collectors are secured, suspended, and free from cross contamination. Sharpsmart collectors eliminate over 28% of plastic and cardboard. All collectors are washed through Daniels’ unique robotic Washsmart which ensures safe and effective sanitization to an extremely high degree of microbiological efficacy with zero harmful chemicals. To reduce water usage, fresh water from later stages of the robotic process is recycled back for earlier-stage use. At the completion of the Sharpsmart robotic washing process, a final quality control inspection ensures that containers are clean and fully functional. Sharpsmart containers are made with replaceable parts; any damaged components are removed, sorted, and sent to plastic reprocessing plants to be ground down and recycled. Peer reviewed in four independent studies, clinically proven to reduce needlestick Injuries by up to 87%, and relied on by healthcare facilities around the world, the Sharpsmart system is driven by a single objective – To Save Lives. Designed with 13 safety features, manufactured with needle-impenetrable plastic, a gravity balanced safety tray for risk-free sharps disposal, and a built-in overfill protection mechanism, the Daniels Sharpsmart is the most advanced sharps container system in the world. Infection risk… could this be reduced by safe waste practices? With safety as our primary driver, learn why Daniels has invested millions of dollars in R&D to develop world-leading leakproof containment systems, robotic washing processes achieving the highest levels of bacterial load reduction, and a suite of space-optimizing accessories that enable hands-free operation and point-of-use accessibility. Daniels recognizes that a clinical environment requires a clinical solution, and safety in an infection controlled environment is not simply a ‘nice to have’. We talk about hand-hygiene, we talk about “touches” and the spread of infection, what we don’t talk about is the impact waste in a patient environment has on infection control. Bins being wheeled from ICU through to a loading dock, static containers that never undergo high-pressure wash or sanitization, open-lidded bins in patient wards. At Daniels, we are rethinking what clinical means when it comes to medical waste management.